I wanted to share a recent recipe we made this past weekend. 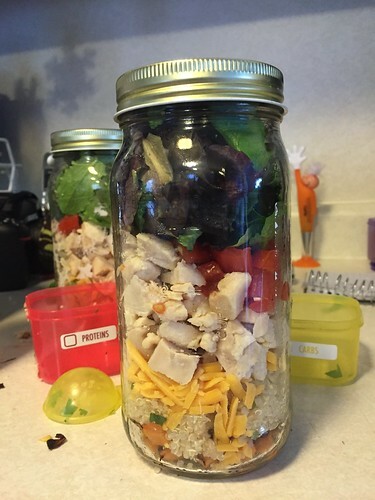 Mason jar salad's are all the hype right now, as they should be; they are amazing! With a little time and effort put forth on Sundays, Kyle and I have at least two lunches accounted for during the week. Saves so much time later on as we can just grab a jar from the fridge and go. And since we are following the 21 day fix clean eating plan, I like to mark the top of my jar lids with a little sticker to remind us the container count. 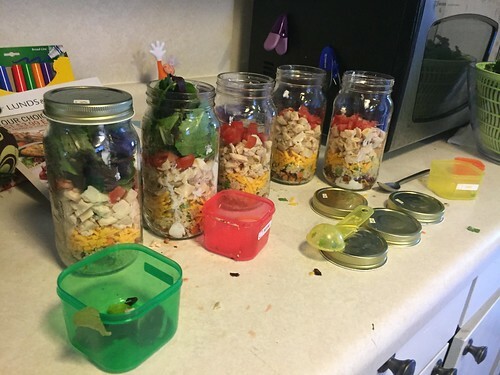 I originally found this recipe on Strictly Delicious, but I needed to make some modifications and additions to make it how I wanted and to figure out a correct fix container count. The fix count ends up being 1 yellow, 1 red, 1 green, 1/2 blue, and 1 spoon. I don't know about you but we haven't been to chipotle in quite a while after all the E.Coli scares and people getting sick. Which is sad because it was one of our favorite places to eat. This doesn't excatly taste like a Chipotle burrito bowl, but it's pretty darn good and healthy for you! Make quinoa and sweet potatoes a head of time; these need to cool. In small pot on stove-top cook quinoa and 2 cups water, bring to boil. Reduce heat, cover and simmer for 20 minutes. Once cooled add lime juice and about 1/4-1/2 cup cilantro. Cut up sweet potatoes into small chunks (I love using my vidalia chopper for this!). Head the coconut oil in skillet, add potatoes once hot and brown on all sides. Once brown, reduce heat and cover. Let cook until sweet potatoes are soft, set aside to cool. Now comes the fun part! Assembling the jar salads! Layer salads in this order; this is for one jar, repeat with remaining four jars. I liked to use matching jars I have that were originally jarred peaches from Costco. Sprinkle some of the remaining cilantro on top before screwing on the lid. Place in fridge, til ready to eat. If it's just you, you have lunch for the week!!! 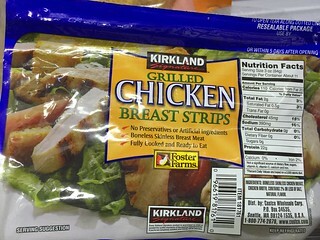 Kyle and I share these so it gets about half our lunches planned for the week. You could try and eat it out of the jar, but I prefer to dump it on a plate so I can mix it all together better.